At this time of year the kitchen garden is in full swing with warmer, longer days allowing edible crops to mature and ripen. There’s still lots of work to do though to keep your plot productive and ensure a succession of edibles right through the summer months. If you’re lucky enough to have a designated kitchen garden with raised beds, brick paths and maybe even south facing walls for ripening fruit, you’ll have room to grow pretty much anything you like and lucky neighbours probably benefit from plenty of edible presents just now! If your garden’s on the smaller side though, it makes sense to use the space wisely and grow things you can’t buy in the shops, or things that taste much better when the journey from plot to plate takes just a few minutes. Beans are a great example – unless you have a good farmer’s market nearby you don’t often come across broad beans or runner beans and they’re not just delicious but quite easy to grow. The bright scarlet flowers of runner beans are a pretty addition to the summer garden but do pick the beans when they’re still young and tender. Mangetout is another lovely thing to have handy in the garden and scrambles easily up pea sticks without much looking after. Another luxury for home growers is being able to pick baby vegetables – carrots, courgettes and tiny peas fresh from the pod. If space is really at a premium, you can nearly always fit in a few salad vegetables and it’s not too late to get going with these even now in the middle of summer. Once you keep the soil damp, seeds will germinate very quickly at this time of year, usually within days. The loose salad bowl types of lettuce are brilliant as you can snip off a few leaves whenever you like and you don’t need to wait for the plant to form a proper round head. Do watch out for slugs when they’re tiny though. Crisp radishes and spring onions or scallions can also be sown now and picked when young – just keep sowing every couple of weeks to ensure a fresh batch. 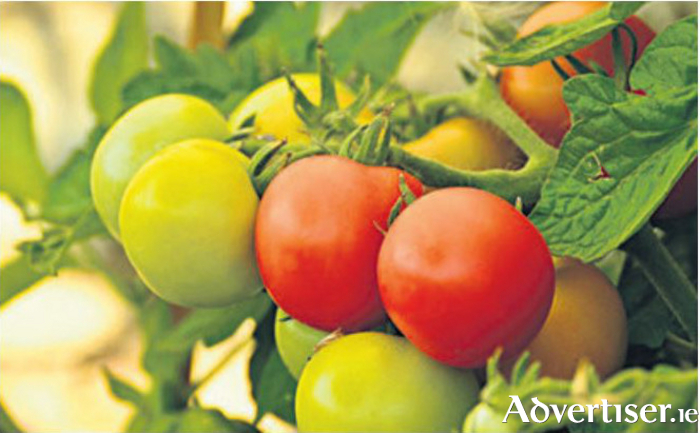 Tomatoes in a pot can be ripened on a sunny windowsill – why not try a sweet yellow cherry variety for a change? Outside, crops to keep on the water watch list around now are runner beans, spinach, celery and courgettes – don’t let the soil dry out as even when it’s raining, the leaves can have an umbrella effect and the roots might not get enough water. When peas have finished cropping, cut them down to ground level but don’t pull up the roots. The roots have nodules on them which contain nitrogen which is really beneficial for leafy brassicas, so try planting your winter cabbages or purple sprouting broccoli in the same area to get the benefits.